Long, long ago, when the Earth was flat and the continents were all connected together, there were people who walked on it. The land was dry and bare, except near the oceans. People had dug out man-made lakes to create lively civilizations. Some trees started to grow and children found bushes with berries in them. It is also important to know that there were animals that were bigger than all of the settlements put together living on Earth. These animals were dinosaurs, all kinds of them. They were fierce animals that always got their way, killing almost anything that came in sight. Food was hard to come by with limited amounts of berry bushes and small rodents to eat. Dinosaur eggs were the most nutritious and filling food on Earth, but they were hard to steal from right underneath the dinosaur’s nose. At this time, the world was starting to become a more populated and efficient place, and then a tragedy happened. One of the people who walked through the civilizations was Alysis. She walked alone, being separated from her family nearly five years ago, when the disaster on Earth first occurred. One night, while she was sleeping, the shaking got so strong and furious that everyone in her village fled the area, hoping to get away from the horrible shaking. She was in the same hut that her family was in, but somehow they had gotten separated with all of the commotion. It was like everyone in her settlement had gone one way and she ran in the opposite way, but how could they let that happen? She was slightly afraid, but she had to be strong and think positively if she ever hoped to find her family on the big, flat Earth that she lived on. The land continued to shake after she was separated from her family like there were roaring waters underneath them, but Alysis was nowhere near the ocean. When the shaking of the Earth first started happening, no one thought twice about it. They thought the gods were the ones who were shaking the land, punishing them for some wrongdoing. But throughout Alysis’s journey across the lands in search of her family, the shaking got significantly worse. Although Alysis was afraid because she was in the world on her own, her family had taught her the skills she needed to start up her journey to wherever she wanted. She knew she would survive without her family, but she hoped that one day she would find them so they could be together and safe. When Alysis was quite young, she had realized she had a skill that no one else taught her or even had, unless they were hiding it, too. Alysis was strong…really, really strong. If she really focused, she could move things not only with her body, but with the force of her body as well. Alysis did not know what this meant, but since she had been separated from her family, she believed that it was important for her to continue on in her search for them and make some good out of the special skill that she had been given. Sometimes, when Alysis would lie down for the night under the bright and shining stars, something from above would speak to her. Although she did not spend much time learning from her parents, she knew these were the gods speaking to her, telling her that she was going to one day do great things with the powers she was given, if she headed in the right direction. This was confusing to Alysis because she had no idea in which direction she should be traveling. The gods had never steered her elsewhere so she continued to walk in the same direction, towards the West, every day and every night. She hoped that her powers would someday lead her back to her family. As she continued on her journey, the shaking of the Earth began to worsen, becoming almost constant. One day, Alysis saw something miles up ahead. It gave her determination to continue walking even though the Earth was constantly shaking out of, what she thought, was the anger the gods had. Finally reaching the things she had seen miles off in the distance, she saw three men with joyous looks on their faces. “Greetings.” Alysis said formally to the men. Her parents had taught her to be the most formal with people you had never met before, even if they were strange looking. “I have been traveling for a long time now, alone, fending for myself. Do you have any dinosaur eggs you can spare that I could eat?” Although Alysis was a strong girl and could fight and kill any animal that came near her, no edible animals had come her way in the past few days. “Hello Alysis, we know exactly who you are. We have been waiting.” The tallest man said to her. She looked surprised, wondering what they meant by that. And how did they know her name? Was her family near? How else would they have known a girl like her was headed in their direction? Another shock came to her while she was eating the delicious dinosaur egg. Could he read her mind? “Oh yes, dear,” the same man spoke. “You know, you are not the only one with a special skill. I can read minds and I read yours quite clearly. We have been expecting you, the gods told us you, Alysis, were coming.” She almost stopped eating the dinosaur egg because of how surprised she was, but she was too hungry. “Now,” the last man said, “it is prominent that we move fast. We know this will come as a surprise to you, but you are the Goddess of Strength. You have always been the Goddess of Strength, but the gods were waiting to show you your true powers until it was time. The time has come – it is your job to help put an end to this horrible shaking we have been enduring by using your skill of strength to stop the land from endlessly moving.” He spoke quickly, like something bad would happen if he didn’t get the words out of his mouth as fast as possible. “What do you mean? How do I do it? Right here, right now? I don’t think I am prepared to do this, I am so young!” Alysis said with fear in her eyes. “Come here, young one,” the first man spoke again. As she walked over to him, he reached out his arm to touch her left temple, staring deeply into her frightful eyes. Knowledge and ideas poured into her, things she needed to know about the challenge she was about to face. Images of bare land cracking, water, settlements of people miles away fearing for their lives and moving day by day to get away from the problematic cracking land. Her eyes flung open with somewhat of an understanding of her task. In only a few seconds, she was able to get as much information she could about travelling to the land where she would help people. She knew she had to keep going westward and where she would find the land by the ocean where the shaking problem started. What she had received from the man were short clips of the problem she had to fix, but she still did not know exactly what she was supposed to do. But, she was the Goddess of Strength. Why had the gods never told her this before? “You were meant to find us. When it was time, dear,” the mind reader interrupted her thoughts. “Wow. This is a lot to take in at once. I am a Goddess? I can help people, save lives – stop the land from caving in and making the land fall into the ocean.” Alysis stated. They gave her a few things in a sack made of dinosaur skin and she was off to do whatever task they had put in her mind. She did not completely understand it, although she did not want to tell the men that, but she thought other people would help her to figure out her task throughout her journey to the unknown cracking area of the Earth near the ocean. These men were powerful, all knowing men who had taught Alysis in a short amount of time how she could save this planet from being empty again. But what would she do when she got to that place, where the land would fall apart if she did not step in? As Alysis hurried through the daylight and into nighttime to find the place she was searching for, the gods started speaking to her. She fell asleep that night wondering what was coming her way and what exactly she had to do to save the planet. It was hard to understand that such a big problem had been laid upon her shoulders, but she would do whatever she could to stop the Earth from shaking. She awoke with a wetness on her face: warm and thick. A dinosaur had creped up on her as she slept, knowing that she was similar to the type of thing that had taken her eggs in the past. Alysis, still in a sleepy state, did not know what to do and this Hadrosaurs would eat her right up if she did not think fast. As she started to come out of her foggy, sleepy state, she quickly remembered she was a Goddess, and more importantly, the Goddess of Strength. As she stood up, the dinosaur lunged at her. She closed her eyes tightly and showed her palms to the deadly Hadrosaurs, and then she heard a screech. She had become stronger, even though before she definitely had this power with her hands and did not know what to use it for. She never knew she could throw an extremely large dinosaur across an area twice the size of the height of a Hadrosaurs. It must have been the knowledge she gained about being the Goddess of Strength that allowed her to do things she had never done before. She finally knew how to use her force for good. With her goddess powers, she knew she would do great things with the help of the gods above. “Well, take that!” Alysis screamed from far away. The dinosaur seemed to stir a little, so she picked up her dinosaur skin sack and started to run very, very quickly. Alysis still did not know how far away she was from the land that was cracking. And she still did not know what she would do when she got there. Would a god give her advice from above or would she have to decide for herself? She knew she could move large things, hopefully even land, with the forces in her body, but were there other secret powers that Alysis had because she was the Goddess of Strength? Would she learn about some more of her powers when she got to the area where the land was cracking, near the ocean and the end of the world? She wished someone would lead her in the right direction, telling her how she could fully use her goddess powers and defeat the problems more quickly. She continued walking, sometimes fast and sometimes slower. She was always afraid that something could be coming her way when she least expected it. So that night, she went to sleep with fear in her head, hoping nothing would come her way that could kill her in her sleep. She awoke to a noise that was louder than she had ever heard before. All of the gods were talking at once, screaming at her, at least she thought. “Hurry! Alysis! Go! You don’t understand! Alysis! Go! Go! Go! You must hurry! Alysis! ALYSIS! GO!! !” and it continued, louder and louder with words that were so jumbled she could hardly make out what they were saying. When she heard the screams from the sky, she instantly started running without being fully conscious. As she awoke completely, she replayed the gods message in her head – she had to get out of the area very quickly. And that is what she did because she knew she was an important part of this plan to save the Earth. She was going as fast as she could, but was it fast enough? Was there another way she could get there faster? After running for what seemed like hours to Alysis, she started to slow down because of the activity she saw in the distance. Was it the settlements? Or were they travellers? Or were they just random people that had been moving from the place they had previously lived? Soon she discovered that they were people, running quicker than she had ever seen people run before. With their horses and wagons and children coming towards her with fright in their faces, she decided that they must be the people from the settlements by the land that was cracking. She needed to talk to them and see how much farther it was until she got to the cracked land and find out why exactly they were running. But how? They were so fast and so furious looking, there was no way a little girl like her could stop them dead in their tracks and ask them for help. Then she remembered she was not just a little girl anymore. She was a goddess: the Goddess of Strength. She could stop them with the power she had within her. She pushed her hands out in front of her and with all of the force she could push out of her body she stopped the people coming her way. She needed help from her eyes, but they all stopped right where they were, some people flipping and falling over because of the speed they were traveling towards her with, but regardless, they were stopped. “Don’t you remember what the gods told us a few days back? She’s comin’. She’s come to help us. To stop the Earth from shaking so furiously! It’s the Goddess of Strength!” one of the members of the crowd yelled out to the other people. “Oh, goddess! You are no little girl. You are so strong and wise. And we know you will save us from the land that keeps crackin’ in. Please!” another group member yelled from inside a wagon. “Where do I go and how much farther is it?” Alysis asked, worry in her voice. “Oh. You are so so close Alysis! You must keep runnin’ and you will be there much before dark! Then do what you can to save us!” another traveler shouted. They all left again in a hurry and thanked Alysis for all that she did. Alysis felt like she was going to fail them because of her lack of knowledge, but all she could do was try her best. With her newfound skills and knowledge of being a goddess, she believed she could do much more than she ever thought possible. Again, she started off running, looking back at the flat land behind her to see if the settlement people were still in sight. They were, but hardly, because they were running just as fast as she was towards safer land. After they were out of sight, she continued to look forward to the horrible cracking land that was causing so many problems in the world. She continued running as fast as she could, but she grew very hungry. She ate the last of the food in her sack, hoping that after she did what she could at the cracking land, she would be given more or taken somewhere that had something for her to eat. She thought the gods must praise her; after all, she was the Goddess of Strength. After she had scarfed down her remaining food, she began to run again. “Yes, Alysis. Go. You are so close. Save the world.” She heard a god speak from above. Although she had stopped dead in her tracks with the sight of the land she had been looking for for so many days, she started to sprint faster than she had ever before. Sweat dripping off of her face, hunger and thirst in her stomach, she made it to the cracking land so quickly that she had no idea what to do when she finally made it to the edge of the world. Ocean water was flowing and taking pieces of the cracked land along with it. She thought about her strength. She must use her strength to do something to stop the Earth from constantly shaking. Although she had become used to the shaking after constantly enduring it for so many years, it still needed to stop before anything worse happened. Suddenly, something came over her. Her head filled with knowledge of what to do to save the remaining land from falling into the ocean. “Dig. It is time to dig. To push all of the dirt to places where it isn’t now. To create holes in the Earth so the water can come up between the landmasses. There is too much pressure – the land does not have enough strength to hold itself together with the roaring water rushing around and trying to get underneath it. I will dig and build up the land on the edges to make a large whole across this land.” Alysis said and no gods disagreed, so she started without hesitation, because it seemed like she did not have much time. With the most amount of concentration she had ever given to anything, she focused all of her force and power on the land in front of her. Pushing so hard on the land that had already started cracking, moving the areas apart that were naturally being pushed apart from the ocean water. The first hole she dug was wonderful, so smooth on the edges. And when the water started to come through the bottom, she stopped and held her breath, and then the water stopped squirting up through the bottom of the Earth. It started flowing and stopped where the land was still put together. The land seemed like it was floating on water in these places, but she knew it was just underneath the land pushing up, like where every edge of land meets the ocean. That’s why there was too much pressure coming from the water, trying to push the land apart. The water wanted to be where the land was. If she could fix this area then the pressure should not be too strong in other places and the land should stop shaking all over Earth. Alysis continued, digging holes and building up the land around the edges in some places. Some edges were smooth; some were rough when she had to start moving land somewhere else if there was an unexpected crack and she thought the land might come crashing down. Water was flowing through the whole vast amount of land as it started going out to the ocean. Although the area was so incredibly large, Alysis found that she could see every edge and crack and crease in the area, like her eyesight had improved with her knowledge of being a goddess. There were some places in the immeasurable area that were dry with no water near them because the water had not cracked through these parts yet. Some land was taller than others, but with every move Alysis made, the Earth stopped shaking a little. After what seemed like hours of protruding the land and fixing every last crease she could see, the Earth was hardly shaking anymore. The last crack she could see was right next to her feet and it was almost bursting at the edges with water spurting through the land. She was exhausted, but she knew after this last bout of strength, she would be able to stop and look at the land that she had saved. With the most force she could put towards the land, she dug out right next to her feet and created a very shallow opening to this new created land. She felt still for the first time since she could remember. Then, a roar louder than the gods shouting at her earlier that day, came from the sky. The gods. She had saved Earth and all of the people who settled in this area. Although they were no longer in the area, she was sure they would come back and see the creation she had made as soon as they felt the stillness of the world. She took her time to look around and see the land she had created with the strength in her little body and mind. It really was beautiful, flowing land. Today, people all over the grand Southern state rely on the water from the area Alysis created so many years ago. It is the important area where the Goddess of Strength came and saved the planet from crashing in on itself and the ocean. 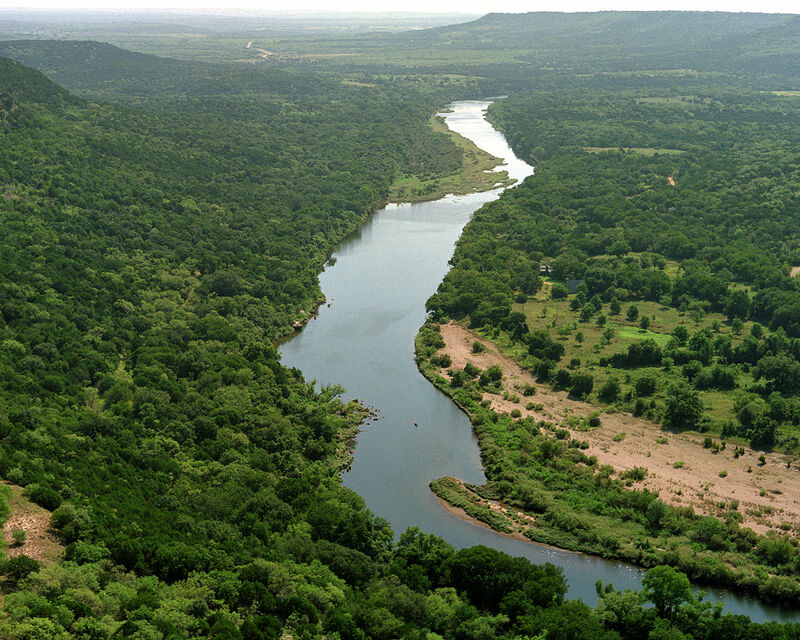 Alysis still looks down on the land and water in this area today from up in the sky as the Goddess of Strength and she is proud to know that the people of Earth have named the land something so powerful like her: The Brazos River in Texas.